This article is about knowledge in Buddhism and Dzogchen. For the organization, see Rigpa organization. Tibetan letter "A" inside a thigle. The A, which corresponds to the sound ‘ahh’, represents kadag while the thigle represents lhun grub. In Dzogchen teaching, rigpa (Tibetan: རིག་པ་, Wylie: rig pa; Skt. vidyā; "knowledge") is the knowledge of the ground. [note 1] The opposite of rigpa is marigpa (avidyā, ignorance). Unknowing (marigpa) is not knowing the nature of mind. Knowing (rigpa) is the knowing of the original wakefulness that is personal experience. In Dzogchen, a fundamental point of practice is to distinguish rigpa from sems (citta, (grasping) mind). Rigpa has two aspects, namely kadag and lhun grub. Kadag means "purity" or specifically "primordial purity". Lhun grub in Tibetan normally implies automatic, self-caused or spontaneous actions or processes. As quality of rigpa it means "spontaneous presence"[note 3] It may also mean "having a self-contained origin", being primordially Existent, without an origin, self-existent. 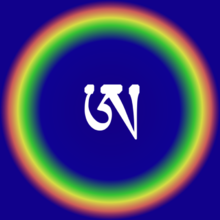 This division is the Dzogchen-equivalent of the more common Mahayana wisdom and compassion division. Citing Dodrupchen Jikme Tenpe Nyima, the 14th Dalai Lama states the full measure of rigpa occurs with the third vision. The practice is that of Cutting through Solidity (khregs chod), which is related to primordial purity (ka dag); and Direct Vision of Reality (thod rgal), which is related to spontaneous presence (Ihun grub). ^ Norbu 2002, p. 56. ^ a b Schaik 2004, p. 5. ^ Kunsang 2006, p. Chapter 15. ^ Kunsang 2012, p. 154. ^ a b Dalai Lama 2004, p. 32. ^ a b Rinpoche Dzogchen Ponlop 2003. ^ Dalai Lama 2004, p. 30. ^ a b Hookham 1991, p. 49-50. ^ Dalai Lama 2004, p. 183-4. ^ Dudjom Rinpoche. Wisdom Nectar. Snow Lion 2005, page 296. Guenther, Herbert V. (1992). Meditation Differently: Phenomenological Psychological Aspects of Tibetan Buddhist (Mahamudra and Snying-Thig Practices from Original Tibetan Sources). Delhi: Motilal Banarsidass Publishers (repr. 2005). ISBN 81-208-0870-3 (hardbound).